Gee I'm enjoying using the Irresistibly Yours Designer papers. Particularly with the added dimension of stamping the background of the paper and changing the background colour to make the white design stand out. Come and have a look at what I've done this time with the Floral sheet from the pack. Ok, the cardstock I've used is Blackberry Bliss, Wisteria Wonder and just a touch of Whisper white for the greeting only. I've used the Butterfly Thinlit medium die for my butterfly cut from the Wisteria card and lined with Blackberry Bliss. The feelers on the butterfly were made with Ribbon from the Artisan Embellishment kit and it was finished with Basic Pearls along the body. What a versatile and useful stamp set Sheltering Tree is turning out to be. This time I've made a Father's Day card with it, but you could easily change the greeting for another purpose. Come and have a look. The cardstock used is Mossy Meadow, Crumb Cake and Whisper White. I've also used a small strip of Designer paper from the Irresistiby Yours pack which I've brayered. This is a quick post because I've got to run. Its Basketball for my youngest in half an hour. Have a great day. Irresistibly Yours Wisteria Butterfly card. How is your Thursday going? My husband arrived home from working away this morning so I was hit with an avalanche of washing to do. That didn't leave much time for play. Luckily I did have most of this card assembled in advance. Come and have a look. This is a combination that you may not have seen before. I've used the backgound stamp Wood Panel on the Leafy sheet from the Irresistibly Yours Designer paper pack, blotted and wiped it off and brayered with Crumb Cake Ink. I decided it wasn't quite dark enough so then brayered again with Smoky Slate ink and wiped it off once again to ensure those white leaves are white and aren't stained a different colour. The Sentiment in the Centre cut and framed with the Oval framelits comes from the Butterfly Basics stamp set and the butterflies used here are from the Papillon Potpourri stamp set. Welcome to our Wednesday Card Sketch challenge at the Paper Craft Crew. The sketch above is quite versatile and I've decided today I would use the Irresistibly Yours Sale-a-bration paper for this challenge and combine it with Papillion Potpourri Butterfly stamp set. The technique used on the background paper is that it was first stamped with the butterflies, then wiped off. This Paper is resist, so the ink doesn't stay on the white flowers. I then brayered with Crisp Cantaloupe ink over the entire sheet and wiped it again. Makes it look as though some of the butterflies are in the background and hidden by the flowers. I of course added more butterflies on top as well. The Gorgeous Grunge stamp set was used on the Crumb Cake card layer with both Crisp Cantaloupe and Memento black inks too. Happy Tuesday, how are you today? We've had more showers, but as soon as the sun comes out its humid. I've made this card for a Male Birthday. Its always handy to have a spare card on hand. I seem to be needing male cards a lot. I was actually inspired by a Sympathy Card I saw by Inky Moose which kept to the colours of nature, so I thought I would do something similar for this card. This stamp set is called Sheltering Tree and its so versatile. The cardstock used is Mossy Meadow, Crumb Cake and Whisper White. I've used inks of Soft Suede, Pear Pizazz, Pistachio Pudding and Wild Wisabi. I hope you are having a lovely day. See you next time. I sharing a card today that I made for a dear friend and very good customer. Obviously, he likes Minions so I spent a bit of time doing some research and pulling out my punches doing some punch art to create this one. I placed him on the brick paper from the Adventure Bound paper stack onto this Centre Step card I made. The cardstock used is Night of Navy, Daffodil Delight, Basic Black, Smoky Slate, Soft Suede, Whisper White & Midnight Muse. The Speech bubble stamp comes from the Just Sayin' stamp set and the Birthday comes from the Itty Bitty Banners stamps. I've also used some Yellow Gingham Washi tape on this card. I'm very happy with how this turned out. This is the card from the front. I also took photos from both sides so you could see now it sits. I hope he had a fantastic birthday, and I hope you all have a great day. 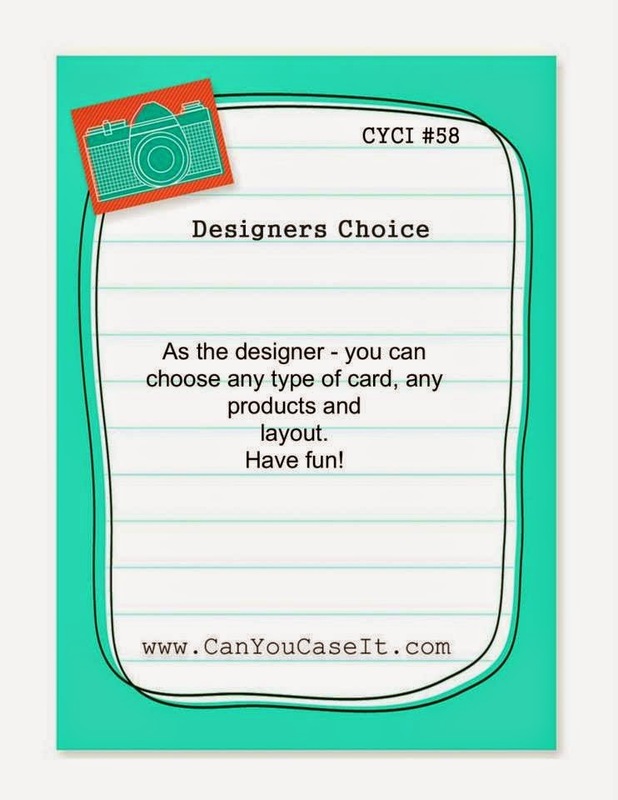 Its Sunday once again, which means its time for another challenge at Can You Case It?. Here are the challenge details for this one. I've decided that today's the day I'm going to show you some elements from the Artisan embellishment kit which I've used on an Easel Card. The cardstock is Pink Pirouette, Whisper White, Soft Suede and Sahara Sand. The row of flowers and Rose die cut come from the Artisan embellishment kit and I've layered up my Papillon Potpourri Butterflies and added them to the card. The greeting comes from the Stamp set Petite Pairs which was stamped with Soft Suede ink and punched out with Oval punches and layered up on Bitty Banner framelits. This forms the anchor for the card front to lean against. Thanks so much for stopping by today. We hope you will join in with our challenge at Can You Case It? this week. We had a lot of rain overnight here as ex Tropical cyclone Marcia made her way down the coast last night, sitting above us at about 3am this morning. It rained solidly for 5 hours till 8am before it started to ease off a bit. This afternoon there were even glimpses of sunshine. Tanks are overflowing and gardens and lawns are soggy, but no damage here thankfully. I am back with another card I've made using a neat resist technique with the Irresistibly Yours Designer paper. I really love the versatility of this pack in that you can change it to any colour you like. Today I've chosen Wisteria Wonder. Come and have a look. We are expecting more rain tonight after ex tropical cyclone Marcia heads down the coast towards us. I know its been a tense day for the people of Central Queensland and we are hoping that everyone stays safe and no one is seriously injured in this terrifying event. A Category 5 Cyclone is as big as they get, a monster storm. Glad we will only receive the rainful from it here. I wanted to share a really pretty card I've made on this very very wet day today. I've used a base card of Brushed gold for this one, combined with Pink Pirouette and Gold Foil with Irresistibly Yours designer paper that I've brayered pink. I've used the Gold foil with my Butterfly Thinlits die along with elements on my card from the Artisan Embellishment kit, available for purchase from our Occasions Catalogue. Here's the full pic of the card. The sentiment comes from the stamp set Petite Pairs and has been punched and layered with Oval punches. It was my daughter Anna's 14th Birthday yesterday. She is becoming quite opinionated about her likes and dislikes for a card, so this one was rather difficult for me to make something that she was going to be satisfied with. I was told no Owls, no Minions (which is what I thought she would like), and definately NO Butterflies! You can imagine my shock at those words. Very cutting, lol. When I tried to get from her just what she would like put on her Birthday card her response was "Happy Birthday". Gotta love 'em. I've made a Centre Stepped Card for Anna and there's no doubt who its for, because I used the Little Letters framelits combined with the Big Day stamp set. The main image on the centre and the cake have been coloured with Blendability markers and the centre piece was cut out with the Label Framelits die. Come and have a closer look. Welcome to the Wednesday sketch challenge at the Paper Craft Crew. Here is this week's sketch. I've used the Sale-a-bration stamp set Big Day combined with the Something Lacy background stamp for my card. I've also used the Label Collection framelits to cut and mat the stamped image and Blendability Markers to colour it in Pink Pirouette and Soft Sky. The Cardstock used is Pink Pirouette, Whisper White and Brushed Gold. The Something Lacy stamp was used on the Pink Pirouette background and heat embossed with Gold powder. It's not often I actually stamp and colour an image for the inside of a card, but the cake did go nicely with the sentiment on the outside. I actually really like my double bow on this card too, made with Pool Party seam binding. Please let me know what you think of this one and visit our site Paper Craft Crew for some more inspiration. We would love to see your card in the gallery. Happy Tuesday to you all. I've made a Flip card today that uses the Label thinlit card die which I've combined with the Sale-a-bration stamp set called Big Day. We seem to be having a few teen birthdays so I've made this one to have on hand for the next Surprise party that crops up. These cards are notoriously had to photograph, so I've had to hold it so you can get a better look at the front image. The cardstock used is Island Indigo, Whisper White and Dazzling Diamonds glimmer paper. The cake image has been coloured with Blendabilities markers and the greetings from the Big Day stamp set have been stamped with Island Indigo Ink. The patterned paper is from the vintage pack called Watercolor Wonder. Here's the front of the card. The Dazzling diamonds glimmer borders have been punched with the Dotted Ribbon Border punch. Here's a pic of the other side of the card, or the flip side as I like to call it.